A selection of helix antennas in Antenna Magus. 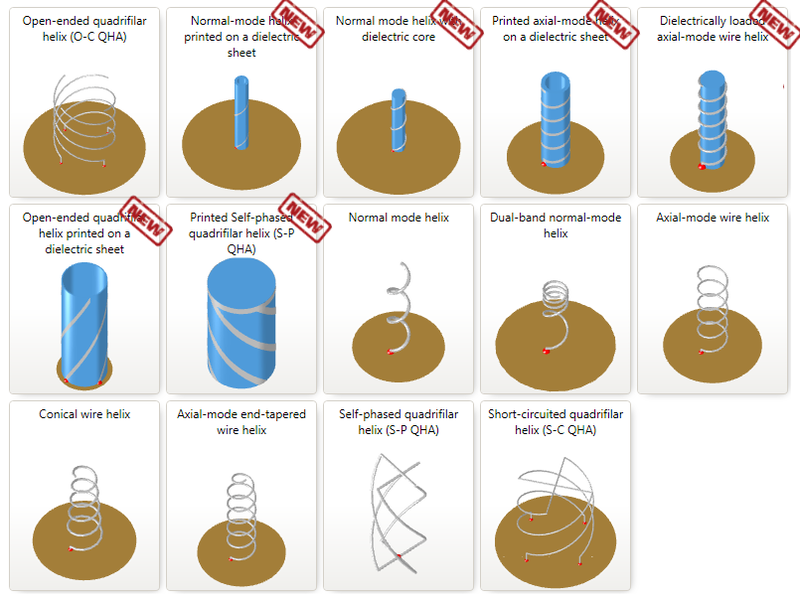 Up until release 2.3, Antenna Magus has provided information, models and designs for 8 different helical antennas in the basic helix antenna classes, namely: axial-mode helices, normal-mode helices and quadrifilar helices. All of the helices, however, were 'self-supporting' (i.e. no dielectric support structures were included). With the release of Antenna Magus 2.4, six more helical antennas have been added (2 axial-mode helices, 2 normal-mode helices and 2 quadrifilar helices). The newly added antennas are aimed at the design of helical antennas that include dielectric structures in their construction. The addition of dielectrics inevitably complicates the design of the antennas, but is usually done to either miniaturize the antenna, or to provide mechanical support for it. These new additions to Antenna Magus make for very practical, realizable helical antennas - particularly at higher frequencies and when using popular low-cost mass production techniques. The effect of dielectric support structures on the performance of each of the different classes of helices is quite different, as each class of helix has an entirely different mechanism of operation. Axial mode (or end-fire) helices support a travelling-wave with phase-velocity slightly less than c, and exponential amplitude decay along the length of the helix - due to radiation losses. The addition of a dielectric support structure affects the phase-velocity of the traveling-wave axial mode helices and the pitch angle and helix dimensions need to be modified to maintain the traveling-wave performance at the required frequency. The interaction between the dielectric support structure and the helix is complex and the addition of a dielectric tube support is very different to that of a solid dielectric core. Generally, the higher the relative permittivity of the core dielectric, the lower the operating bandwidth of the antenna without specific miniaturization effects and lower permittivity support dielectrics are preferred for good performance. The normal mode helices, however, have a resonant or standing-wave current distribution along the length of the conductor. The effect of a dielectric support is therefore primarily related to the electrical length of the conductor in the effective dielectric medium at the dielectric/air interface. There are many more additions and adjustments that can be made to helical antenna structures to make them more practical. These include more complex feed structures and integration of matching sections at the feed point as well as other topologies and variations for specific applications. While we hope to add more helices to Antenna Magus in future, the 14 helices that are available provide a good foundation for design of helix antennas for a wide range of applications and situations.